Just prior to the northern end at the Tremont neighborhood in Cleveland, the northbound lanes of Interstate 71 form a double-deck freeway with the ending Ohio 176 north. The southbound lanes of both freeways travel at-grade nearby. Photo taken by Steve Hanudel (06/18/06). Interstate 71 constitutes a two-state route from Louisville, Kentucky northeast to Cincinnati, Columbus and Cleveland in Ohio. I-71 has more miles to the east of Interstate 75 than it does to the west of I-75. The route of I-71 through northern Kentucky takes the freeway through hilly terrain to the south of the Ohio River. Wide medians and steep hillsides are encountered along the route. One such stretch in Carroll County, south of the Kentucky River, is where a tragic bus crash occurred on May 14, 1988. 27 people died when a wrong way drunk driver collided with a church bus. Signs are posted at the site in each direction. North of Walton, Interstates 71 and 75 combine through the south suburbs of Cincinnati through Florence, Erlanger and Fort Mitchell. The pair reach urban Covington and cross the Ohio River along the double decked Brent Spence cantilever Bridge. A replacement of the 1963-opened bridge is planned, with construction starting in 2017. 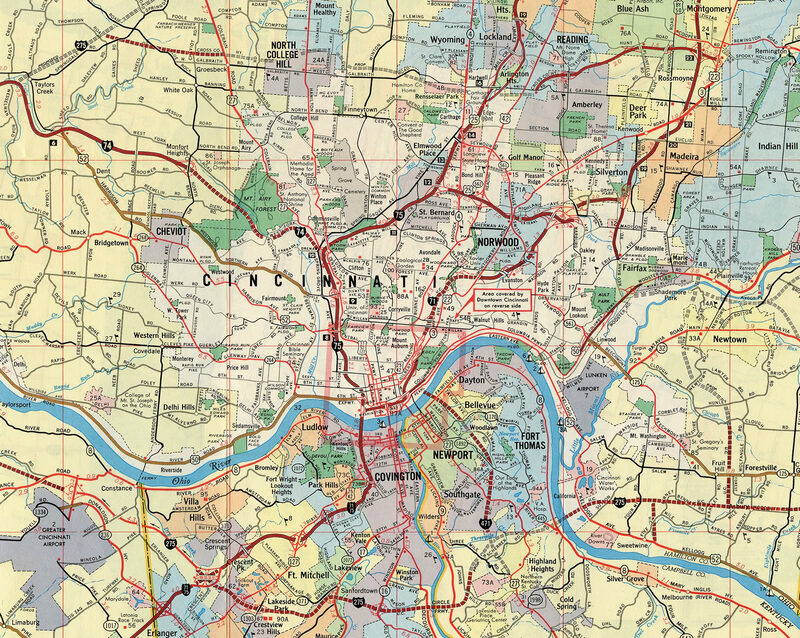 Within the Buckeye State, Interstate 71 turns east between the Ohio Riverfront and Downtown Cincinnati along Fort Washington Way before veering northward through Lytle Tunnel along a winding route to Norwood, Kenwood and Blue Ash. Leaving the Cincinnati suburbs, I-71 turns easterly again across a mixture of agricultural and forest land toward the Columbus metropolitan area. Entering the suburbs of Columbus at Grove City, Interstate 71 curves northward to parallel the Scioto River ahead of Downtown. The freeway combines with I-70 across the river along the southern periphery of the central business district before resuming a northward course to the east of Downtown. This stretch is slated for improvements due to the weaving traffic patterns of the I-71 mainline. Interstate 71 otherwise continues north through the capital city to exit it near Worthington and Westerville. Beyond Columbus, Interstate 71 again resumes with rural environs north to Berkshire where it bends northeast for the Cleveland area. Bypassing Mansfield to the east, I-71 traverses a swampy area by Charles Mill Lake ahead of Ashland. Remaining rural, the freeway extends northeast to meet the west end of I-76 near Westfield Center and south end of I-271 outside Medina. 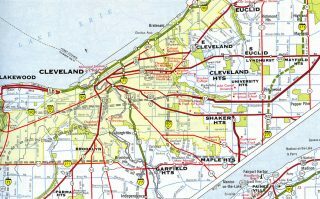 The outer suburbs of Cleveland ensue along the northward drive by Brunswick and Strongsville, with I-71 passing by Cleveland-Hopkins International Airport (CLE) along an increasingly urban route at Brook Park. The final stretch of I-71 takes the route east from the airport area through west Cleveland and northern Brooklyn. 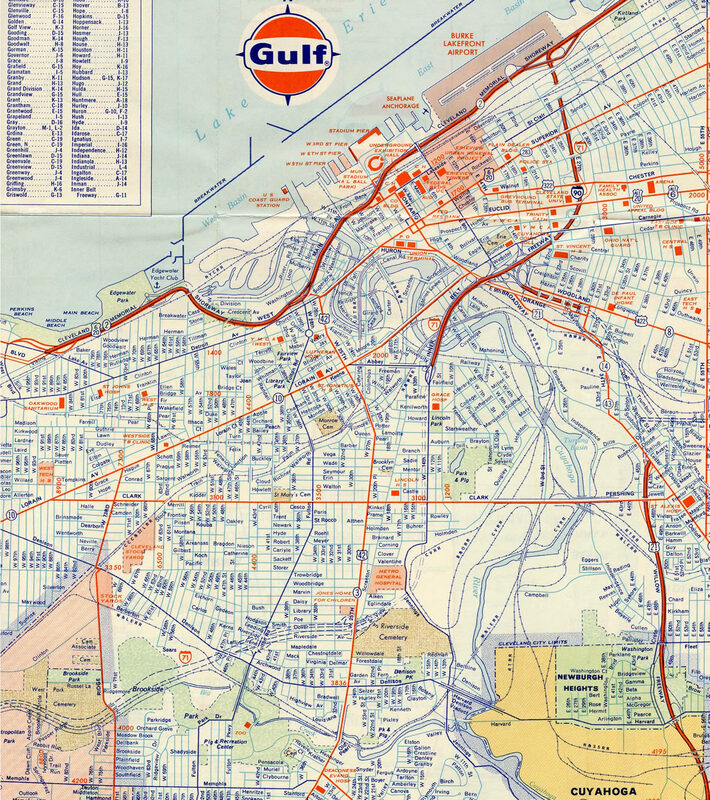 The route overtakes the north end of the Jennings Freeway (Ohio 176) before ending at Interstates 90 and 490 and the Innerbelt. Interstate 71 in Ohio is part of High Priority Corridor 78. Interstate 71 largely follows U.S. 42 from Louisville to Cleveland. U.S. 25 and 127 tie into the corridor where I-71 overlaps with I-75, and U.S. 22 parallels I-71 northeast from Cincinnati to Wilmington in Ohio. North from Wilmington, U.S. 62 accompanies the freeway corridor into Downtown Columbus, where U.S. 23 ties in and runs just west of I-71 to Orange. 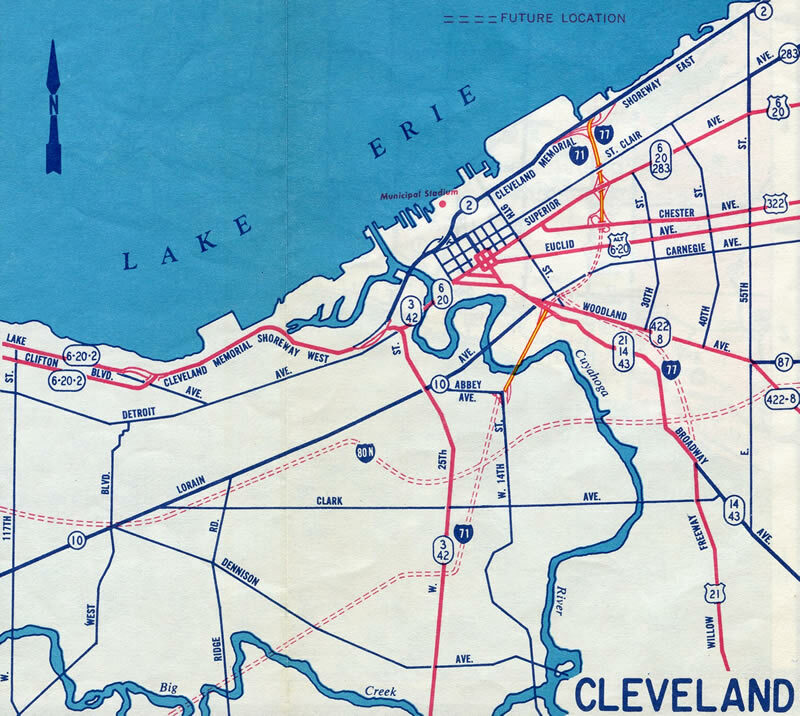 Interstates 71, 80N and 90 proposed to encircle Downtown Cleveland in 1962. Interstate 90 proposed along the Parma Freeway leading north from I-80N to the Cleveland Memorial Shoreway. Had this been built, I-71 would have traveled along the Innerbelt Freeway north to the Shoreway. Within Columbus, the Ohio DOT previously proposed a pair of plans to deal with worsening congestion in Downtown. One option was to reroute Interstate 70 south of its current alignment between Exit 98/U.S. 42 and near Milepost 106. In this plan, Interstate 70 would take a new alignment at Exit 98, connecting to Interstate 71 and Ohio 104 south of Downtown and southeast of Cooper Stadium. From there, I-70 would take over Ohio 104, and a new connection would be constructed in the vicinity of U.S. 33 (Exit 105) that would link the new I-70 to the existing I-70. In exchange, the existing route of Interstate 70 between Exits 98 and 105A, including the notorious interchange with I-71, would be replaced with a 35 mph boulevard. 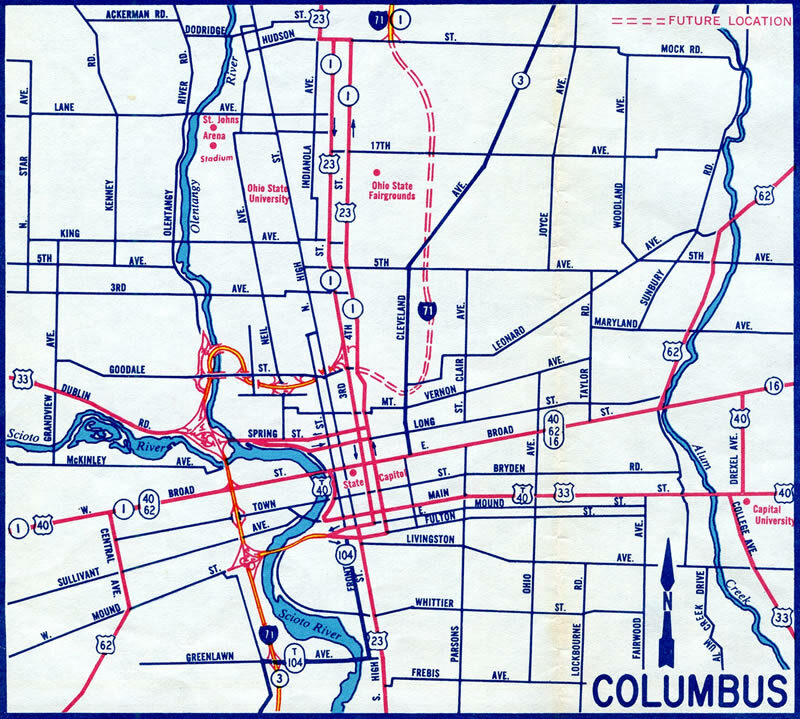 Renamed the Columbus Crossroads project, work to unravel the weave of Interstates 70 and 71 was packaged in the larger $1.1 billion umbrella of projects that included rebuilding the junction between I-71 and Interstate 670 to the north. The I-670 project (Phase 1) was completed in November 2013 as were subsections of Phase 2 including the Africentric School retaining wall, the Mound Street Connector and the 18th Street Bridge. The remainder of Phase 2, including work at the east junction between I-70 and 71 (Project 2D – East Interchange), was scheduled to start in 2017, but a lack of funding in 2016 for the $166 million project pushed this back to 2018.3 Construction on Phase 4B (I-70/71 South Innerbelt) may commence in 2023 when funding is expected. Interstate 71 in Ohio was established in 1962; the freeway was completed through the state by 1975. The route cosigned with Interstate 75 across the Brent Spence Bridge, a cantilever bridge with a double deck linking Covington, Kentucky with Downtown Cincinnati. The two Interstates partition at the north end of the span, with I-71 joining U.S. 50 east across the trenched freeway of Fort Washington Way. A lengthy collector distributor roadway system runs along Interstate 71 through the interchanges with Fulton Road and U.S. 42 (Pearl Road) as the mainline travels 1.5 miles to the junction with Interstates 90 and 490 east. Photo taken by Tim Kubat (April 2006). Interstate 71 passes under U.S. 42 (Pearl Road) with six overall lanes. The northbound lanes separate in 0.75 miles for a c/d roadway to I-90 west and I-490 east and Exit 247A. Photo taken by Tim Kubat (April 2006). The c/d roadway from U.S. 42 returns as I-71 curves northeast one half mile to Exit 247A with West 14th Street, Clark Avenue and Steelyard Drive. Photo taken by Tim Kubat (April 2006). Interstate 71 north enters a wye interchange with Ohio 176 (Jennings Freeway). The left two lanes continue north to Interstate 90 east, while the right-hand lane departs next for a c/d roadway with the ending Jennings Freeway to I-90 (Northwest Freeway) west and I-490 east. Photo taken by Tim Kubat (April 2006). Interstate 71 north travels on a viaduct directly over the northbound lanes of the Jennings Freeway to Exit 247A and the c/d roadway for Interstates 90 and 490. Photo taken by Tim Kubat (April 2006). The c/d roadway partitions into ramps for Interstates 90 (Northwest Freeway) west to the Detroit-Shoreway and Cudell neighborhoods of west Cleveland and 490 east to Interstate 77 and North Broadway. Photo taken by Tim Kubat (April 2006). Continuing north, the I-71 mainline defaults onto I-90 (Innerbelt Freeway) east to Downtown. These button copy signs remained in service until at least 2009. Multi-year construction starting in 2011 replaced the Innerbelt viaduct over the Cuyahoga River. The work included revisions to ramps with U.S. 422 & Ohio 14, East 9th Street and Interstate 77 south. Photo taken by Steve Hanudel (06/18/06). Traveling across the 1959-built Innerbelt bridge over the Cuyahoga River, 0.75 miles north of the transition to Interstate 71. This span was replaced as part of the 2011-16 Innerbelt Project. Photo taken 05/25/02. Crossing over the original Fairfield Avenue overpass, Interstate 90 carried four lanes south with no shoulders to the four-level interchange with I-71. The Innerbelt Project shifted the westbound lanes for I-90 just to the west of this scene. Photo taken 05/25/02. 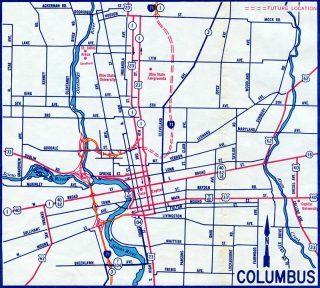 Interstate 71 southbound began its course to the capital city of Columbus as Interstate 90 turned west en route to the suburbs of Lakewood and Rocky River. There is no access from I-90 west to Interstate 490 east at this junction. Photo taken 05/25/02. Former button copy signs posted at the southbound beginning of Interstate 71. 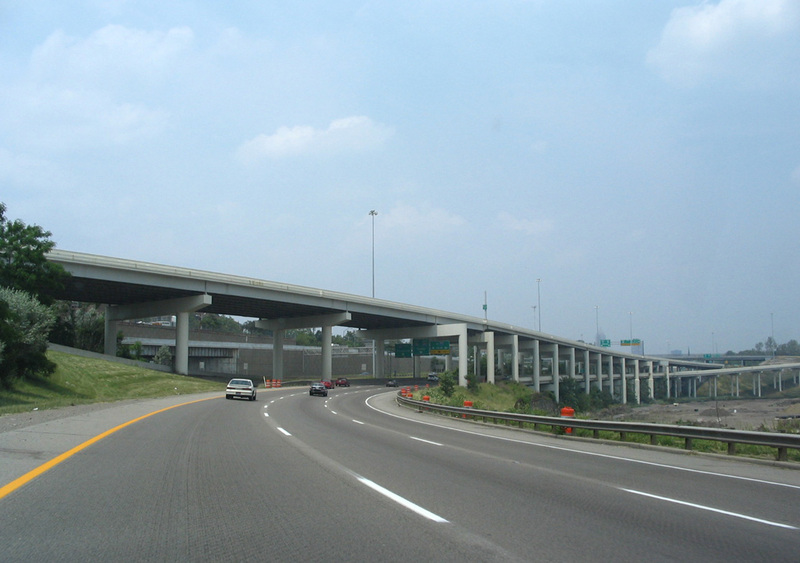 The Medina Freeway travels the highest level of the four-level interchange with I-90 west and I-490 east. I-71 otherwise extends the Innerbelt Freeway south to Ohio 176 (Jennings Freeway). Photo taken by Kevin Vance (01/02). Passing through the split-diamond interchange (Exit 169) with West 41st and 44th Streets at Detroit-Shoreway, I-90 (Northwest Freeway) east is one mile ahead of Exits 170B for I-71 (Medina Freeway) south and 170C for I-490 east. Photo taken 09/30/10. Exit 170 departs I-90 east next for U.S. 42 (West 25th Street) for the Ohio City Near West Side community. Exit 170B follows for both Interstate 71 (Medina Freeway) south toward Columbus and Ohio 176 (Jennings Freeway) south to Brooklyn Heights and Parma. Photo taken 09/30/10. Interstate 90 turns north onto the Innerbelt Freeway in one half mile as Interstate 490 east begins. I-490 east provides the default movement from I-90 to I-77 as direct access from the Innerbelt to Interstate 77 south was removed in April 2011. Photo taken 09/30/10. Exit 170B for Interstate 71 south departs from the ramp carrying Interstate 90 east from the Northwest Freeway to the Innerbelt Freeway. A four-level interchange joins the two freeways with I-490 and the Medina Freeway. Photo taken 09/30/10. Interstate 490 extends east from the Northwest Freeway through Tremont to I-77 and the future Opportunity Corridor to Kinsman and University Circle. Photo taken 09/30/10. Travelers turning south from I-90 east via Exit 170B form a distributor roadway separate from the Medina Freeway mainline to the wye interchange (Exit 246) with Ohio 176. The Jennings Freeway stems south through Brooklyn Center and Old Brooklyn to connect Interstate 71 with 480. Photo taken 09/30/10. Interstate 490 travels a short distance west from Interstate 77 at the North Broadway neighborhood to Interstates 71 south and 90 west at Tremont. There is no access to I-90 (Innerbelt) east in this direction. Photo taken 09/30/10. Traffic partitions with two lanes leading to Interstate 90 (Northwest Freeway) west to Lorain and the Ohio Turnpike for Toledo and two lanes for Interstate 71 south to Ohio 176 (Jennings Freeway) for Parma and Columbus. Photo taken 09/30/10. Interstate 490 runs along the north side of Tremont Park as it enters the four-level interchange with Interstate 71 (Medina Freeway) south. Photo taken 09/30/10. Heading north along the Innerbelt Freeway toward Cleveland Memorial Shoreway (Ohio 2). This view looks at Interstate 90 north at the locally known “Dead Man’s Curve”, where a sharp ramp takes I-90 east onto Ohio 2 toward Bratenhal. Photo taken by Tim Kubat (April 2006). A compact trumpet interchange sandwiches between a railroad line and Cleveland Burke Lakefront Airport (BKL). Several warning signs and a 35 MPH speed limit precede the nearly 90 degree turn of Interstate 90 east. A loop ramp also departs here for Ohio 2 (Cleveland Memorial Shoreway) west toward Lakewood. Photo taken by Tim Kubat (April 2006). Traveling east on Ohio 2, the freeway approached the trumpet interchange with Interstate 90. Photo taken by Tim Kubat (April 2006). Ohio 2 (Cleveland Memorial Shoreway) defaults onto Interstate 90 east toward Euclid as the Innerbelt Freeway takes I-90 west south to both Interstates 71 and 77. Photo taken by Tim Kubat (April 2006). 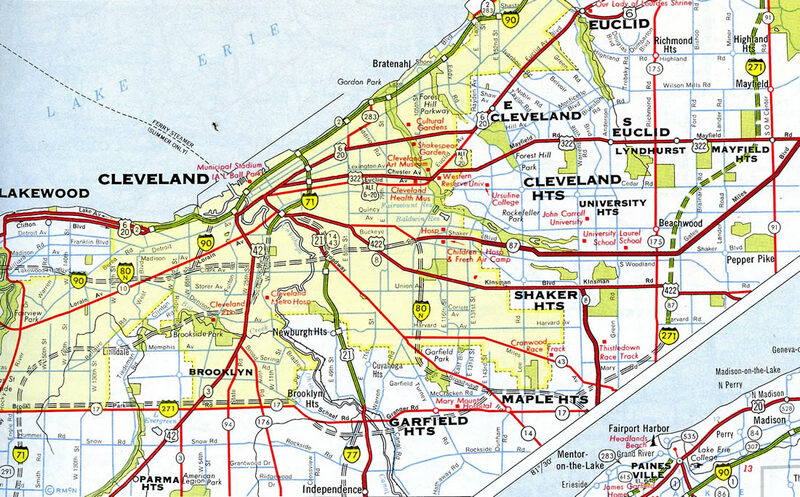 Interstate 90 combines with Ohio 2 for 10.6 miles along the Lakeland Freeway to Euclid. I-90 west overtook the northernmost 3.5 miles of I-71. Photo taken by Tim Kubat (April 2006). An independent ramp links I-71 south with Interstate 64 west independent of the Kennedy Interchange with Interstate 65. Photo taken by Chris Patriarca (05/26/03). The Downtown Louisville skyline comes into view ahead of the Interstate 71 separation into ramps for I-64 and I-65. Interstate 64 enters the exchange from the southeast, paralleling the Ohio River as it navigates through Downtown en route to New Albany, Indiana. Photo taken by Chris Patriarca (05/26/03). A pair of end Interstate 71 shields precede the partition of Exits 1A and 1B. Photo taken by Chris Patriarca (05/26/03). Exit 1A departed for Interstate 64 westbound to New Albany and Evansville, Indiana and Saint Louis, Missouri. The mainline continued to I-65 (Dr. Martin Luther King, Jr. Expressway). Photo taken by Chris Patriarca (05/26/03). Traveling east on an elevated viaduct adjacent to the Ohio River, eastbound Interstate 64 approaches the Kennedy Interchange with I-65 and I-71. Photo taken by Steve Hanudel (08/19/05). The left two lanes exit to Interstate 65, while the right two lanes continue east on I-64 to north I-71. Photo taken by Steve Hanudel (08/19/05). Traffic headed to I-65 north across the Abraham Lincoln Bridge to Jeffersonville and Clarksville, Indiana and Dr. Martin Luther King, Jr. Expressway south through Louisville parts ways with Interstate 64 east. Photo taken by Steve Hanudel (08/19/05). Interstate 64 winds east through the Kennedy Interchange toward Exit 6 with Interstate 71 north to Cincinnati, Ohio. Photo taken by Steve Hanudel (08/19/05). Interstate 71 begins from I-64 at a wye interchange (Exit 6). Photo taken by Steve Hanudel (08/19/05). Southbound Interstate 65 crosses the John F. Kennedy Memorial Bridge over the Ohio River ahead of the exchange with I-64 and I-71 north. Photo taken by Chris Patriarca (05/26/03). Ramps for Interstate 64 and 71 north separate from I-65 at the south end of the John F. Kennedy Memorial Bridge. The cantilever span was reconstructed and converted to southbound only traffic following the completion of the northbound Abraham Lincoln Bridge in 2016. Photo taken by Chris Patriarca (05/26/03). Crossing the Kentucky state line, I-65 southbound continued to a lane drop for I-64 west to Evansville, Indiana and I-64 east to Lexington. Photo taken by Chris Patriarca (05/26/03). Guide signs for the Kennedy Interchange along the John F. Kennedy Memorial Bridge previously omitted tabs for Exit 137. Both I-64 east and I-71 north combine with I-75 at Lexington and Covington respectively. Photo taken by Chris Patriarca (05/26/03). Exit 137 separates from I-65 southbound and immediately splits into ramps for I-64 west to St. Louis, Missouri, I-64 east to Frankfort and the northbound beginning of Interstate 71. Photo taken by Chris Patriarca (05/26/03). Upgrades at the Kennedy Interchange rebuilt both ramps to Interstate 64. The connection to I-64 east and I-71 north was expanded to two lanes. Photo taken by Chris Patriarca (05/26/03). A new elevated ramp replaced the previous roadway leading to I-64 east and I-71 north. 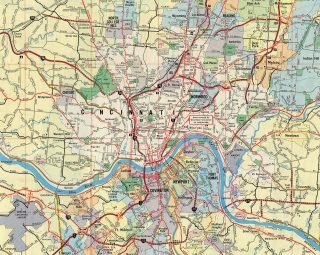 Lexington lies 110 miles to the east, while I-71 reaches Cincinnati in 97 miles. Photo taken by Chris Patriarca (05/26/03). The connection with I-64 east and I-71 north from the Kennedy Bridge formerly lowered to grade level between the east and westbound roadways of Interstate 64. Photo taken by Chris Patriarca (05/26/03). An arrow per lane (APL) sign replaced the first overhead for Exit 137 (I-64 and I-71 north) on Interstate 65 northbound at Muhammad Ali Boulevard (Exit 136C). Photo taken by Chris and Amber Lokken (04/07/08). Reconstruction of the Kennedy Interchange shifted the separation with Exit 137 further south. Two lanes continue north across the tolled Abraham Lincoln Bridge now, with two connecting to I-64 and I-71 north. Photo taken by Chris and Amber Lokken (04/07/08). The John F. Kennedy Memorial Bridge and Big Four Pedestrian Bridge came into view as Exit 137 departed Interstate 65 north for I-64 west to St. Louis, I-64 east to Lexington, and I-71 north to Cincinnati. Photo taken by Chris and Amber Lokken (04/07/08). “Plan takes I-70 out of Downtown.” Columbus Dispatch, February 7, 2004. “Next Phase of Interstate 70/71 Construction Delayed Until 2018.” Columbus Underground, April 12, 2016. “No Respect for Noble Roadway.” Cincinnati Post, The (OH), January 26, 2004. “Fort Washington Way 2000.” city of Cincinnati, online slide presentation. Accessed on September 26, 2016. “Final paving to begin on Ft. Washington Way.” Cincinnati Post, The (OH), May 17, 2001. Page updated September 26, 2016.